In order to make a deal, you can use "Make deal" command in the context menus of "Market watch", "Open positions", "Sum open positions", "Orders", "Chart" windows or select "Trade -> Make deal" of the main menu. In the opened "Make deal" window we choose the volume of the deal, for example 10. In the field “Volume” we set the amount 10.00 and press green button "Buy". Аs a result buying operation of 10 units of «&Nd100/PS500” will be performed. This buy command will result in execution of group of two operations with the components of this PCI. In "Open positions" window a line with buy position for our PCI will appear. By clicking «+» on the left of the PCI name, lines with positions of all PCI components will open under the PCI line. In our simple example buy positions on 10 Nd100 contracts of the base part of the PCI and sell positions on SP500 in corresponding calculated volume (in the example 20.17 contracts) of the quoted part of the PCI will be opened. In the "Make deal" window we choose the volume of our PCI, for example 1.6 units and make a BUY deal. This buy command will result in execution of group of operations with the PCI components. In "Open positions" window a line will appear with buy position for our PCI. By clicking on the sign «+» on the left of the PCI name, lines with positions of all PCI components will open under the PCI line. In our example 4 buy positions on the assets of PCI base part and 2 sell positions on the assets of PCI quoted part will be opened in corresponding calculated volumes. PCI trading rules are similar to trading on Forex market. Thus, in our complex example opening of positions on assets of PCI base part is performed with 1.6 volume, and for positions on assets of the quoted part normalization on numerical value of the PCI is performed at the moment of the deal. In our case the moment of the transaction is PCI = 1.09851, that is why the volume of the deal, for example, on XAUUSD will be 1.09851*1.6*40 = 70.30, and for #C-WHEAT- 1.6*42.8522 = 68.56. Deals on PCI instruments are made in lock mode, i.e. opposite positions of this personal instrument are not summed, and both positions remain on the client's account. Any position of PCI component can be closed as a common position – in that case that PCI ''breaks down'' (and is deleted from the client's local PCI base), but all the remaining positions on other components remain as common positions. For PCI deals “Deviation” parameter cannot be used. All orders are being performed with PCI prices at the moment of the deal according to market prices of the included instruments (in the window “Deviation” the value “Any” stands). While opening and closing PCI positions, results of all operations with the PCI components will be displayed on the screen in separate windows. If you do not need that information to show any longer, you can select Settings ->Terminal ->Miscellaneous and tick "Don’t show trade operation result dialog". The same option can be set, by ticking "Don’t show trade operation result dialog next time" in any window with the operation result. Along with transactions of buying and selling, common operations with orders, such as setting, modifying and deleting pending orders, as well as setting linked orders Stop Loss and Take Profit can be performed on PCI positions. For PCI there is no “Order distance” and orders may be set “In the market”. The current Bid and Ask prices of the PCI and the spread as Ask-Bid difference are calculated from the current Bid and Ask prices of all components, taking into account their weights in the instrument structure. At the moment of the new tick (quotation changes) flow of any PCI component the server makes calculation for conditional buying and selling of PCI unit, which provides live Bid and Ask prices. 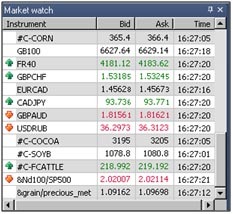 These prices are reflected in “Market watch” window in corresponding columns, and the spread is formed. Let in case of our complex PCI at one moment in “Bid” and “Ask” columns of “Market watch” window the rates be 1.09162 and 1.09698. As a result, the spread = 1.09698-1.09162 = 0.00536. The precision of PCI quotation is set in six significant figures (sum of figures before and after the decimal point), i.e. the number of signs after the point will be determined and fixed at the moment of PCI creation or modification. Swaps on PCI open positions are calculated as a sum of swaps of its components (on open positions of the included instruments). The margin of PCI open position is calculated as a sum of margin values of the included components.The created PCI can be only traded at the trading hours of its components.